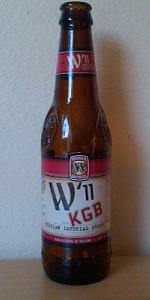 Formerly a rotating release, "KGB" is being re-released as "W'11" in late 2010 - with seasonal winter/spring availability. A: Opaque black with less than one finger of diminishing beige foam head. Moderate lacing remains on the glass. Transmission of light increases as the volume in the glass drops, showing clear, dark brown. S: Black roasted malt is restrained in intensity, with an herbaceous accent. Coffee and toffee combine to make a sensation of unctuous mocha dessert. No alcohol is detected. T: Begins almost dry, with roasted grain that is bitter and slightly scorched early. Earthiness makes an appearance in what is otherwise just a few simple flavors. Faint coffee emerges in the middle as the roasted malt is able to divorce itself from the bitterness somewhat. Moderate bitterness returns in the finish with herbaceous qualities and a hint of sweetness that lingers favorably on the palate. No alcohol is detected. M: Medium to thick viscosity, smooth on the palate, with moderate carbonation. D/O: This robust stout is not extreme by the standards of the style, but it is able to hold its own. It presents generally clean flavors with no chocolate and little to no fruitiness, with only some coffee notes present to make it comparable to another food. It demonstrates an unassuming approachability down the stretch, with less palate fatigue here than with some other, more highly regarded, American-brewed stouts of large displacement. A- Fitting for the style, pours pitch black with a dark brown head ~1/4 in thick. S- Big coffee and chocolate notes. Sweet and roasty. T- Bitter and bitter. Not really getting anything beside bitter coffee. I was hoping for something with more of a chocolate boost, but there is only a slight twist mid sip. Aftertaste is abrasive, like biting a chunk of coal. M- Medium body, which I kind of like for a RIS, not so syrupy like some of the big-boys. O- I was hoping to enjoy this more than I did. Nice price point but thats about it. The aroma leaves much to be desired, taste doesn't follow the nose. Pours dark coffee color with a small tan colored froth. Heavy lacing on the glass. Not much of a detectable smell. Smooth on the front end, but some bitter coffee and nutty flavors on the back end. It tastes pretty good to me for a 9.3% alcohol beer. The more I drink, the better it is. Left some bitterness in my mouth, but that has dissipated as I am 1/3 into the beer. I like it for a Stout. It is pretty filling and I would have troubles drinking to many. Poured from 12oz bottle into a pint glass. Bottle is labeled March 3, 2011. Appearance: solid black body which lets no light through at all. Head is a good finger of creamy tan foam. It's just a great-looking stout. Smell: rich, roasty aroma with a light fruity character. Alcohol is quite noticeable, and there is a touch of tanniny wood aroma indicating this beer may have been oaked (although the bottle doesn't say it was). I quite like it, though there is room for added complexity. Taste: starts off with bitter roasted malt flavors then transitions to a slightly sweeter, slightly fruitier end note. It's not as complex as I tend to like my imperial stouts, but I find it quite tasty. Mouthfeel: nice, silky, somewhat creamy body; there's not a lot of carbonation here but it works quite well nonetheless. I like it. Overall: this is a pretty standard imperial stout. I think it has a good complexity and a good roasty component, although there is room for more fruity complexity here. Pretty good. Thanks Joe for the extra. Poured from a 12oz bottle dated Dec 21, 2010 into a snifter. This brew appears a very dark brown to black color with a finger of dark tan head that fades leaving spots and patches of lace about the glass. When held to the light, it displays some browner shades and clarity around the edges. A light swirl revives a fingers worth of froth. The aroma is fresh coffee with chocolate malt and citrus hops. The hoppiness is pungent and bold yet a pleasant addition to the backend of this brew's smell. A pleasant fresh grain character lingers with a contrasting sweetness to the nose. The taste is roasty grain and pleasantly bitter. Lasting strong coffee flavor coupled with citrus and herbal hops that are quite bold. The alcohol presents a faint fruity flavor and warmth. The roasted bitter aspect is bold and lingers inside the mouth. Not a bad brew, there is a linger lingering almost spiced aspect that adds some additional complexity to this bees flavor. This is a medium bodied offering with a modest level of carbonation. For more than 9% it is hidden quite well. All together well rounded with a forward coffee flavoring. A fairly decent representation of the style and worth checking out. Based on my initial experience I think this is one that would be best enjoyed fresh, I'm uncertain what aging and melding to this brew would do. It lacks a little in it's robust character I look for in a solid RIS. I'm seeing a lot of Sub-Par reviews and I'm disagreeing with them to a point. For a $8.99 six-pack RIS at 9.3% it's a solid brew and value...not to mention ageable! A - Black - teetering on dark brown root beer cola. So-so. T - Well...the dark fruits are there, almost a Belgian quad characteristic followed by vanilla, coffee, and chocolate. You'd guess by everything I mention, it has everything solid that a good RIS should. There's a smokey, almost ashy component that compliments all the above mentioned. Not quite offensive, but not happy it's there either. Will it mellow with age....I hope so. Don't mistake this with roasty...because it's ashy. As it warms, it gets more ashy...the price is keeping me from a 3 score. O - at $8.99 why not pick one up? Good, but nothing to call home about. Mouthfeel was the best aspect of this brew...which is very important when it comes to RIS's. *EDIT* I've now finished the 6er. Thin, ashy and subpar. Go with Green Flash Double Stout or Old raspy for the 4-pack over this 6er... best advise I could ever give. Poured from a 12oz bottle into a clear pint glass. Bottled Feb 16 11 per the label (thank you for dating). Paid $6.59 on sale for a six pack at local grocery chain store. Best price I have ever seen for RIS. Under the cap: A PROST: To having a job that isn't work. I will drink to that. Name is intriguing. Not sure if it refers to the contemporary State Security Agency of the Republic of Belarus, or the former Soviet Union. Mysterious. This beer might pair well with a Robert Ludlum novel. A-Pours a deep, dark brown almost black hue with a two finger tan head with decent retention and lacing. S-Roasted barley, vague dark dried fruits, chocolate, alcohol, and a hint of licorice, all of which were too faint for style (except for the alcohol). Improved as it warmed. May be better with aging. T-Taste is predominantly bitter, alcohol, and roasted barley. This is underdeveloped and no where near complex enough for this great, rich style. Some chocolate, coffee, and caramel malt are present but no where near robust enough. Improved as it warmed, but surprisingly good cold, which is uncharacteristic for style. May be too hoppy. M-Too thin for style. Carbonation is okay. No where near rich and creamy enough. O-Mediocre for style. Since I bought a six pack I will be having this again, but won't buy any more. Price was excellent. I also like to be able get RIS in 12 oz. bottles. Overall, not enough depth. I have to give it a 3.5 since not good enough for 4.0, but really is somewhere in between. Bottled with the oxygen absorbing caps so I think I will age this to see if the aroma, taste, and mouthfeel improve with time. Pour: Dark brown upon pour, and upon holding it up to the light it's a very dark maroon color. One finger of cream-colored head that had average retention and lacing. Smell: Aromas of roasted malt and burnt sugar. Hints of chocolate and hops. Taste: Here's what killed it for me. Strong, but unbalanced flavor, with the lack of balance favoring a very bitter burnt sugar and pine hop bitter back end. Slightly sweet up front, but not enough, with a small hint of coffee in the middle. Mouthfeel: Medium bodied, but light for the style. Also carbonation is unusually high, but has a certain aspect of creaminess. Drinkability: Goes down OK, kind of a challenge to drink. It's an OK beer. Final Notes: I wasn't very impressed with this one. It's not a "bad" beer, but overall not malty enough for the style (the hoppy character is no big deal, just wish it was more balanced). I won't be looking to buy this one again, and there are better ones out there for a comparable price point. Got a six pack of this at the local gas station. A: Very black in color, with a nice dark khaki head at the end of the pour. S: Smells of coffee, and light chocolate aroma. Very nice malt overtones that also does not smell very boozy at all. T: The taste is a little more boozier. At 9% this beer does taste like a great stout. Coffee, some chocolate, dominate the taste. M: This is a nice thick stout. Goes down nice and smooth, and no nasty aftertaste. O: I would probably drink this again on tap, but I don't think I would buy another 6 pack again. Appearance-Black, but not that thick body you want in a big stout. Two finger tan head that dissipates quickly and leaves some pretty nice lacing. Smell-Huge roasted malts, tons. Some coffee and dark chocolate. Very light hop still in the smell after 6+ months. Taste-Roasted malts up front all the way. Lots of it, even some smokiness. Middle get some dark fruits and some coffee. Finish is just straight dark chocolate bitterness. Not sure if it's coming from the malt or the faded hops, but it really lingers on the tongue. Alcohol is no where to be found. Mouthfeel-Medium bodied, compared to other big stouts I had it's a little thin, but still nice. Carbonation is pretty moderate. Overall-A very easy to drink RIS. ABV is almost non-existent. With what else is out there this is lacking some depth, but still a good beer. Pours jet black, small beige head, nothing out of the ordinary for style. Aroma was largely a deep burn of roast. Taste, good, warming, heavily bitter, heavy on the heavy roast, slight hoppy feel to it. Hoppier than most in the style. A little bit too alcoholic to be excellent, but the price point on a 6 of this $9 works very nicely. A good beer, solid second tier option for the style, and nice to have it in 12 oz bottles. Poured into a wine glass. Pitch black with a finger of off white head the dies down to a ring around the edge of the glass. Brown hues towards the edges when held to light. No lacing to speak of. A nose of roasted malt, and a hint of vanilla wafers. Not really much else. Nose is pretty dull. Taste is also fairly dull. Some roasted malt, hints of baker's chocolate, a light smokiness. Some fruity almost banana like sweetness hits mid palate, and the finish is bitter and roasty. Mouthfeel is basically like a dry root beer. Full bodied with good carbonation. It was interesting to try, but I see myself giving away most of the rest of the six pack I bought. A pretty bland and uninspired Russian Imperial Stout. 2013 edition. Has it really taken this long for a Russian imperial stout to be named in honor of the KGB? Regardless, this stuff pours a murky black-brown topped by a finger of khaki foam. The nose comprises mild roasted malts, light chocolate powder, and a dash of blackened pretzel. The taste brings in more of the same, with a strong roasty bitterness pervading the second half of things, along with a hint of nondescript booze. The body is a stolid medium, with a very light moderate carbonation and a thickly smooth feel. Overall, a middling RIS, one that just doesn't bring the proper amount of robustness or control necessary to communicate the style. It appears black with a thin brown like head. It smells like caramel, metal. There is a bitter smell and a bit of a burnt coffee smell as well. The smell is a bit odd and off balanced. It tastes of burnt malts, coffee, and metal. Though it has some strong flavor they seem a bit watered down and a bit off balance. There is bitterness to the beer but it is not a complex or interesting bitterness. This is one dimensional and kind of odd tasting. The mouth-feel is awful it is watery and fizzy. The carbonation is way too high for the style. The drinkability is limited as I feel this is a flawed and dumbed down RIS. Overall this is cheap but it tastes cheap and is not a good example of the style. I have heard for quite a while about a imperial stout made by widmer that really stood apart from other widmer brews in terms of wow factor. It pours a obviously thinish black, but a slight visibility, no head, very tame carb look. Overall, I really hope this is just a dumb'd down for the masses version of from what I heard was a great beer. Maybe with age this could improve but I cant see it really turning that true to style. But dont get me to wrong here, I may still buy another six pack because it is still a 9.3 abv stout for 7 bucks. But once its gone, I wont cry about it. D - Not too bad to drink, just not what you'd expect from a RIS. Deadly! 9% abv hits you quickly, but doesn't disguise the inherent flavor which is the real draw. Opaque chocolate brown body, lightly resonant carbonation, topped by a lovely but quickly dissipating brownish head leaving light tracings. No smell to speak of, which I like. If there is, it is a lightly medicinal hoppiness, like mentholatum or mothballs--not citrusy, not soy, not smokey. Dry. Taste was more complex than I've had in recent stouts including Guiness. There was a hint of fig sweetness, balanced by the immediate dry medicinal bite of hops (or wheat?) backed up by predominant roasted malts, with a definite smooth mouthfeel that made it more than an average lager. None of the soy character, or off green dryness of Guinness. Just bold, lightly bitter, semi-sweet, stout! Definitely smooth character, medium-light body. Powerful beverage polished off quickly...yum!